If you are unable to access any of our articles below via the links provided please feel free to contact us and request a copy. Stride, C.B. and Vandenberg, L. 'The art of face-saving and culture-changing: sculpting Chinese football’s past, present and future'. Sport In Society (2018). Download. Stride, C.B. and Thomas, F.E. 'Tension in the Union of Art and Sport: Competition for Ownership of the Baseball Statuary and its Influence Upon Design'. NINE: A Journal of Baseball History and Culture (2017): Download. Stride, C.B., Thomas, F.E. and Chamorro, A.M. 'Commemorating Tragic Heroes: Statuary of Soccer Players Who Died Mid-Career'. Soccer in Society (2017). Download. Stride, C.B., Thomas, F.E. and Ramshaw, G. 'Standing Out From the Crowd: Imaging Baseball Fans Through Sculpture'. International Journal of the History of Sport 32, 14 (2015): 1611-1638. Download. Stride, C.B., Thomas, F.E. and Smith, M.M. 'Ballplayer or Barrier Breaker? Branding Through the Seven Statues of Jackie Robinson'. International Journal of the History of Sport 31, 17 (2014): 2164-2196. Download. Stride, C.B., Wilson, J.P. and Thomas, F.E. 'From pitch to plinth: documenting the UK’s football statuary'. Sculpture Journal 22, 1 (2013): 146-161. Download. Stride, C.B., Wilson, J.P. and Thomas, F.E. 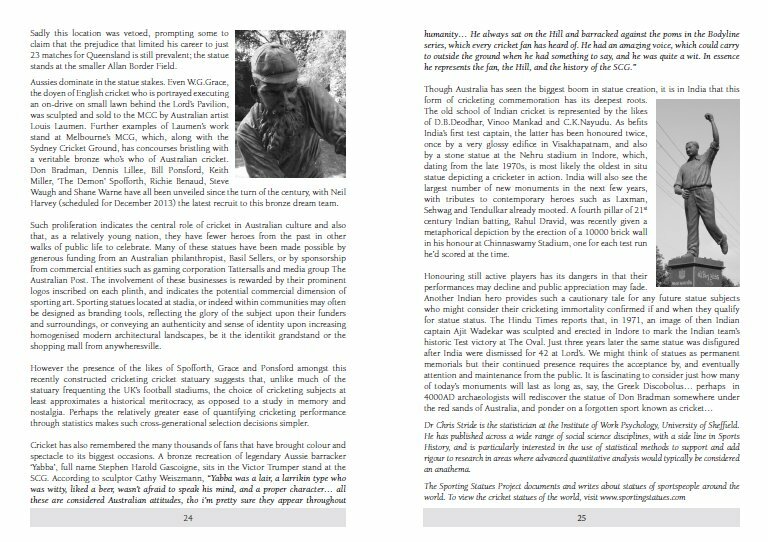 'Honouring heroes by branding in bronze: theorising the UK’s football statuary'. Sport In Society 16, 6 (2013): 749–771. Download. Stride, C.B., Thomas, F.E., Wilson, J.P. and Pahigian, J. 'Modeling Stadium Statue Subject Choice in US Baseball and English Soccer'. Journal of Quantitative Analysis in Sports 8, 1 (2012): 1-36. Download. Stride, C.B., Catley, N and Thomas, F.E. 'The Boss in bronze: Three statues of Brian Clough'. In Haxall, D. (ed) Picturing the Beautiful Game. Bloomsbury Academic (2018). Purchasing information. Stride, C.B., Thomas, F.E. and Ramshaw, G. 'Standing Out From the Crowd: Imaging Baseball Fans Through Sculpture'. In Dyreson, M. (ed) Sport in the Americas: Local, Regional, National, and International Perspectives. Routledge (2018). Purchasing information. Thomas, F.E. and Stride, C.B. 'The Thierry Henry statue: a hollow icon'. In Sandle, D., Long, J., Parry, J. and Spracklen, K. (eds) Fields of Vision: The Arts In Sport. Leisure Studies (2013). Purchasing information. Stride, C.B. and Thomas, F.E. 'Football Statues.' Football Weekends magazine, (December 2016). Scan. Stride, C.B. and Thomas, F.E. 'Statuesque strikers: how football fell in love with figurative sculpture'. The Conversation (July 2014). Thomas, F.E. and Stride, C.B. 'Standing Strong.' When Saturday Comes magazine, 328, (2014): 11. Stride, C.B. 'Bronze boundary markers' The Cricket Statistician, 164 (2013): 22-25. Scan1 Scan2 Scan3. Stride, C.B., Thomas, F.E. and Wilson, J.P. 'From Pitch To Plinth: A Tribute In Bronze.' The Celebration Statue Brochure (2013) . Stride, C.B., Thomas, F.E. and Wilson, J.P. 'From Pitch To Plinth: A Tribute In Bronze.' The Players' Club PFA Magazine (2013). Stride, C.B. and Thomas, F.E. 'Striking a pose.' When Saturday Comes magazine, 294, (2011): 36-37. Stride, C. B., 'Three Minute Guide to Football Statues' (a short film about football statues made as part of University of Sheffield's 2018 World Cup-related-research promotion). Stride, C. B., 'Made of Stone: The Statues of Cycling' (a short film about cycling statues made as part of Sheffield University's 'Deconstructing The Tour' microsite researching the Tour De France). Cardorff, P. and Böttger, C. Der Letzte Pass. Fußballzauber in Friedhofswelten – Zuschauer Erwünscht. (Göttingen: Die Werkstatt, 2005). 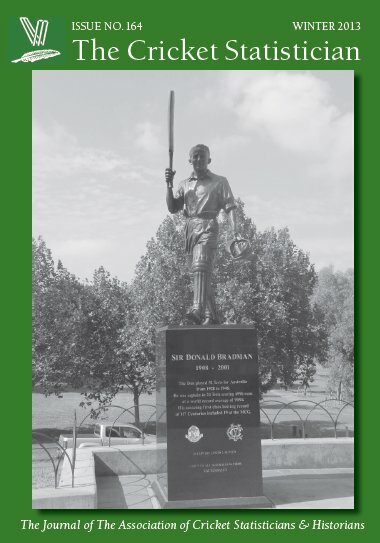 Cashman, R. 'Reflections on Sporting Sculptures at the Sydney Cricket Ground'. Sporting Traditions 33 (2016): 37-53. Cashman, R. 'Reflections'. Sporting Traditions 33 (2016): 97-99. Egan, T. 'The Proposed Steve Abala Role Model Statue'. Sporting Traditions 33 (2016): 93-96. Herzog, M. Memorialkultur Im Fußballsport: Medien, Rituale Und Praktiken Des Erinnerns, Gedenkens Und Vergessens. (Stuttgart: Kohlhammer, 2013). Huggins, M. Death, memorialisation and the Victorian sporting hero. The Local Historian 38 (2008): 257-65. McGuinness, M. 'The Canonisation of Common People: Memorialisation and Commemoration in Football'. In Sport, History, and Heritage: Studies in Public Representation, ed. Hill, J., Moore, K., and Wood, J. (Boydell Press, 2012), 211-22. McMillen, J.D. and McMillen, R.S. 'The Legal Aspects of Sports Sculpture'. Willamette Sports Law Journal 1 (2005): 1-23. O'Mahony, M.J. 'In the Shadow of Myron: The Impact of the Discobolus on Representations of Olympic Sport from Victorian Britain to Contemporary China'. The International Journal of the History of Sport 30, 7 (2013): 693-718. O'Mahony, M.J. 'The art of goalkeeping: memorializing Lev Yashin'. Sport in Society 20, 5-6 (2017): 641-659. Osmond, G. 'Shaping Lives: Statues as Biography'. Sporting Traditions 27, 2 (2010): 101-111. Osmond, G. 'The Duke Paoa Kahanamoku Statue at Freshwater Motivations, Memory and Identity'. Sporting Traditions 33 (2016): 67-91. Osmond, G., Phillips, M.G. and O'Neill, M.E. ''Putting up your Dukes': Statues Social Memory and Duke Paoa Kahanamoku'. The International Journal of the History of Sport 23 (2006): 82-103. Osmond, G. and Phillips, M.G. 'Viewed from all sides: statues, sport and Eddie Gilbert'. Australian Aboriginal Studies 1 (2014): 16-32. Osmond, G. and Phillips, M.G. 'Standing Tall: Memorialising Australian Sport through Statues'. Sporting Traditions 33, 1 (2016): 1-8. Phillips, M.G., O'Neill, M.E. and Osmond, G. 'Broadening Horizons in Sports History: Films, Photographs and Monuments'. Journal of Sports History 34 (2007): 271-91. Schultz, J. 'Contesting the Master Narrative: The Arthur Ashe Statue and Monument Avenue in Richmond, Virginia'. The International Journal of the History of Sport 28 (2011): 8-9. Smith, M.M. Willie Mays Plaza, McCovey Point, and the Dominican Dandy in Bronze: (De)Constructing History at AT&T Park in San Francisco. Journal of the West 47, 4 (2008): 60-69. Smith, M.M. 'Frozen Fists in Speed City: The Statue as Twenty-First-Century Reparations'. Journal of Sport History 36, 3 (2009): 393-414. Smith, M.M. 'Mapping America’s Sporting Landscape: A Case Study of Three Statues'. The International Journal of the History of Sport 28 (2011): 1252-68. Stanton, J. A Monument to Musial: The History of a Statue . NINE: A Journal of Baseball History and Culture 20, 2 (2012): 27-42. 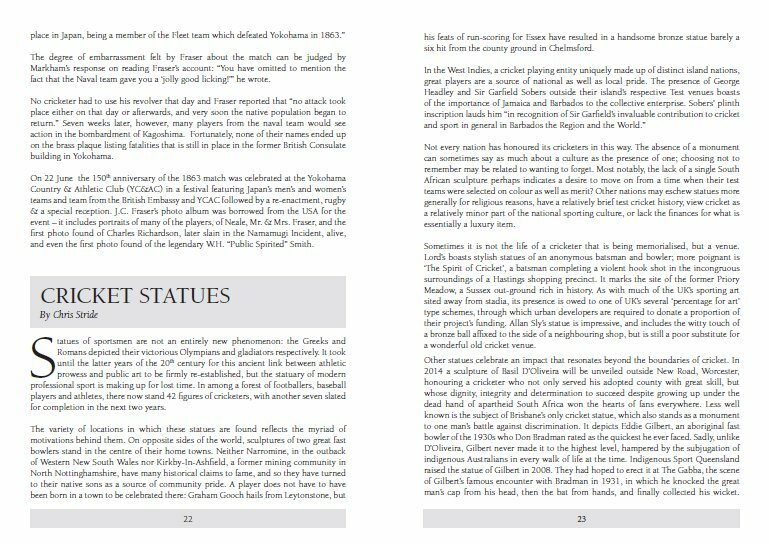 Studham, D. 'Idol Worship at the New Temples of Pleasure: An Examination of Sporting Artworks at the Melbourne Cricket Ground and Its Place in the Nation's Heart'. Sporting Traditions 33 (2016): 9-35. Wangen, E.Die Gräber Der Götter: Fußballhelden Und Ihre Letzte Ruhestätte, Die Werkstatt. (Göttingen: Die Werkstatt, 2009). Whimpress, B. 'Adelaide Oval Sculptures'. Sporting Traditions 33 (2016): 55-65. Armstrong, E. 'Memorializing in Sport: A Comparison of the Responses to the Deaths of Dale Earnhardt and Darryl Kile'. Sociology of Sport Online 6, 2 (2003). Corkill C. and Moore, R. '"The Island of Blood": Death and Commemoration at the Isle of Man TT Races'. World Archaeology 44, 2 (2013). Fairley, S. 'In Search of Relived Social Experience: Group-based Nostalgia Sport Tourism'. Journal of Sport Management 17 (2003): 284-304. Foster L. and Woodthorpe, K. 'A Golden Silence? Acts of Remembrance and Commemoration at U.K. Football Games'. Journal of Sport and Social Issues 36, 1 (2012): 50-67. Goldblatt, D. 'Football Arte'. Soccer & Society 12 (2011): 21-22. Huggins, M. 'Gone but Not Forgotten: Sporting Heroes, Heritage and Graveyard Commemoration'. Rethinking History: The Journal of Theory and Practice 16, 4 (2012). Huggins, M. and O'Mahony, M. The Visual in Sport. London: Routledge (2011). Johnes, M. and Mason, R. 'Soccer, Public History and the National Football Museum'. Sport in History 23 (2003): 115-31. Mandell, R.A. Sport: A Cultural History. New York: Columbia University Press (1984). Penn, R. 'Cathedrals of Sport: Football Stadia in Contemporary England'. In Soccer Review, edited by P. Murphy and I. Waddington. Leicester: Anchorprint Group Ltd (2005). Ramshaw, G. and Gammon, S. 'More than just Nostalgia? Exploring the Heritage/sport Tourism Nexus'. The Journal of Sport Tourism 10 (2005): 229-41. Russell, D. ''We all Agree, Name the Stand after Shankly': Cultures of Commemoration in Late Twentieth-century English Football Culture'. Sport in History 26 (2006): 1-25. Schuman H. and Scott, J. 'Generations and Collective Memories'. American Sociological Review 54 (1989): 359-81. Seifried, C. and Meyer, K. 'Nostalgia-related Aspects of Professional Sports Facilities: A Facility Audit of Major League Baseball and National Football League Strategies to Evoke the Past'. International Journal of Sport Management Recreation and Tourism 5 (2010): 51-76. Taylor, M. 'Football History and Memory: The Heroes of Manchester United'. Football Studies 3, 2 (2000). Vamplew, W. 'Facts and Artefacts: Sports Historians and Sports Museums'. Journal of Sport History 25 (1998): 268-82. Wood, J. 'Talking Sport or Talking Balls: Realizing the Value of Sports Heritage'. Industrial Archaeology Review 27 (2005). Woolridge, J. '"They Shall Not Grow Old": Mourning, Memory and the Munich Air Disaster of 1958'. Manchester Region History Review 20 (2009): 111-32.